Happy Thanksgiving from the Pilgrim & Indian Gnomes! 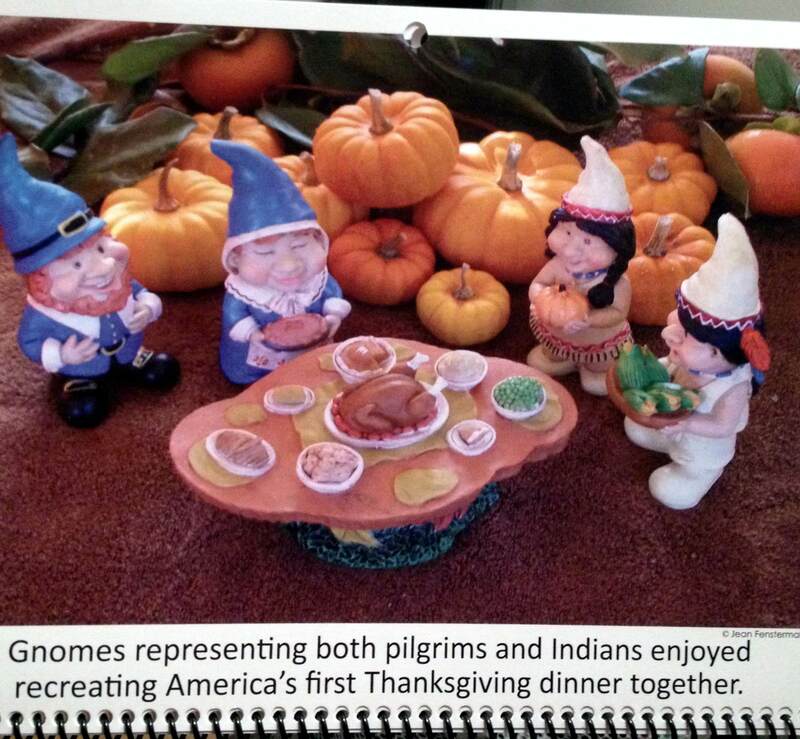 Pilgrims, Indians, and gnomes are reenacting the first Thanksgiving for you…even though none of these parties have actually celebrated together in the history of space and time. Because who doesn’t enjoy an inaccurate and somewhat offensive historical reenactment around this time of year?! Cheers! On behalf of all the drunk gnomes, I’d like to wish you all a Happy Freaking Thanksgiving! Yep, that about sums it up. Now go eat a bunch of stuff. Okey-dokey toot-a-loo. Next up – LIVE reporting from the feasting table! Thank you, and you, and I guess you as well. It’s a snowy day over here at The Gnome Abode. Days like this motivate me to do little more than take swigs from a bottle of rum while writing bad poetry. Dr. A-Choo thinks it’s seasonal depressive disorder. My buddies just think I need to man up and buy a winter coat. My flamingo girlfriend, Noodle Sauce, hates to see me bummed out. So she came home today with a shopping bag full of games. Games about gnomes! Did you know that there even was such a thing?! Find Your Way Gnome: Introducing two MindWare originals where you use critical thinking to create pathways. The tricky part? No paths can intersect! Lab Mice is the cheese-chasing brainteaser where you connect the matching pairs of mice and cheese. Find Your Way Gnome helps colorful gnomes find their matching homes. Each set includes 50 double-sided wipe-off cards (100 puzzles rated easy, intermediate or hard), 2 dry erase markers, full-color instructions and a sturdy storage tin. Oh Gnome You Don’t: It’s adventure time for gnomes as they travel and gather items along the forest trail. Typically cheerful and friendly, the little gnomes let greed and aggression get the best of them as they get into brawls, play tricks, and set traps to be able to grab up and trade for the most gems by the end of the game. It’s a Gnome-tastic Adventure!! 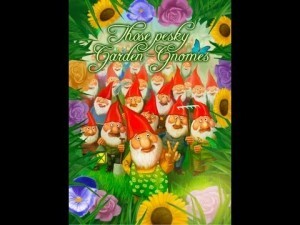 Those Pesky Garden Gnomes: “Garden Gnomes” is a fun and unique card game that really takes a lot of thought and tactical planning to win. Each hand offers exciting possibilities and new avenues to success, and one must always be weary of an opponent’s seemingly poor showing — it could be a ruse to meet a unique goal. The individual victory conditions for each hand and the bid tokens add to an intense and fast-paced game. Noodles, who’s apparently an avid gamer (I had no idea!) was also telling me about a Kickstarter project, A Game of Gnomes: The Garden of Seedin’. Apparently, it didn’t reach it’s fundraising goal in time. But they were asking for $10,000?! What expensive gnomes you have! 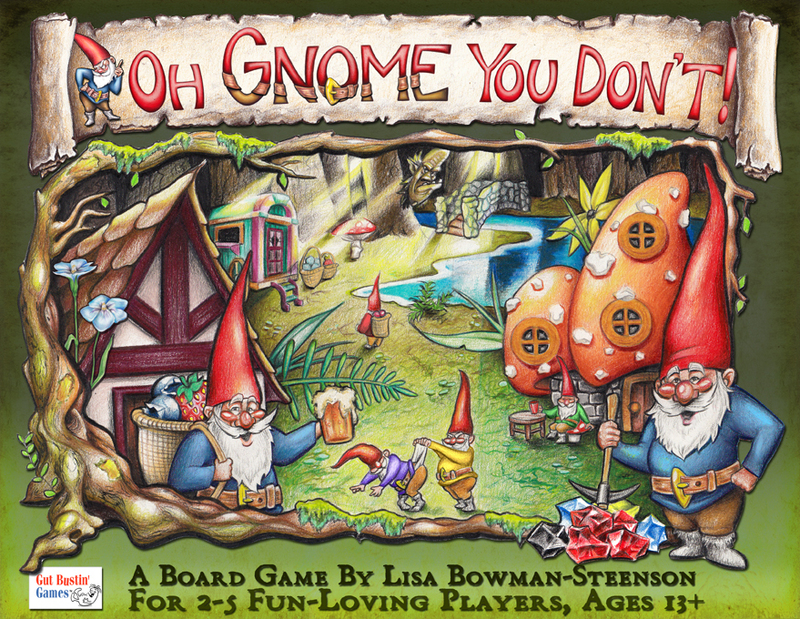 Well I must say that gnome-themed board games have perked up my mood. If you’re needing a little boost today as well, check out some of these or make up one of your own. And then invite me to play! 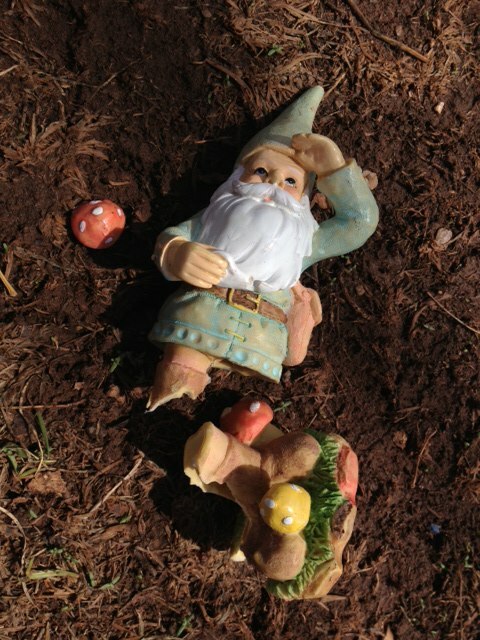 Local Officials Investigate”Gnome Sightings” in Switzerland! 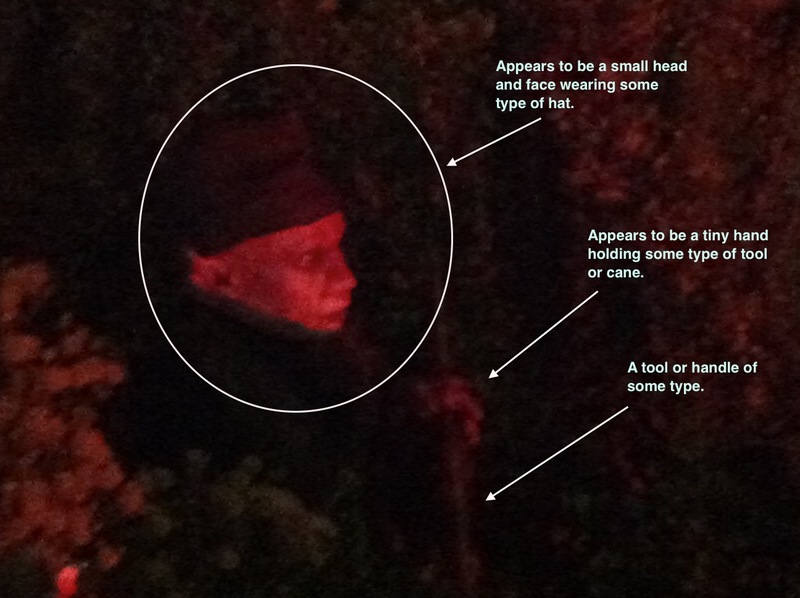 Graubünden, Switzerland — (SBWIRE) — 11/22/2013 — Local officials are investigating a number of “Gnome Sightings” in the Graubünden canton of Switzerland after a local farmer photographed something that some people are claiming “proves that Gnomes are real.” The farmer, who wishes to stay anonymous, setup a hidden motion activated camera after the vegetables in his garden began disappearing. Expecting to catch an unscrupulous neighbor or possibly a rodent, he was shocked by what he saw while reviewing the pictures the next morning. The word Gnome comes from Renaissance Latin gnomus, which first appears in the works of 16th century Swiss alchemist Paracelsus where he perhaps derived the term from Latin gnomos (itself representing a Greek ??-???? ?, literally “earth-dweller”). Some villages in Graubünden have a history of nome sightings that date back more than 500 years. The photos are being investigated by James Moore of the Gnome Society which claims to be the largest “gnomologic community” in the world. “We are running extensive tests on these photos to determine their authenticity but everything so far leads us to believe that these are genuine.” Mr. Moore expects the tests to be completed within two weeks. In the meantime, many villages in Graubünden are recommending that small children don’t go outside after dark. Gnome Society is the original and largest gnomologic community of scientists, historians, journalists, and specialists from diverse backgrounds. The Gnome Society is considered the most credible and respected source in Gnomology. The Gnome Society organizes, investigates and reports gnomologic encounters and directs expeditions to places where the encounters have occurred. Drunk Gnomes Have Blogged 400 Times! Well jump start my scooter and call me Susie. The blue collar gnomes that work inside the interweb just sent me an exciting memo. We drunk gnomes blogged a whopping 400 times! That’s 100 four times over. Also known as 20 twenty times over. That’s as much math as my tiny ceramic brain can handle in one sitting, so I hope you get the picture. 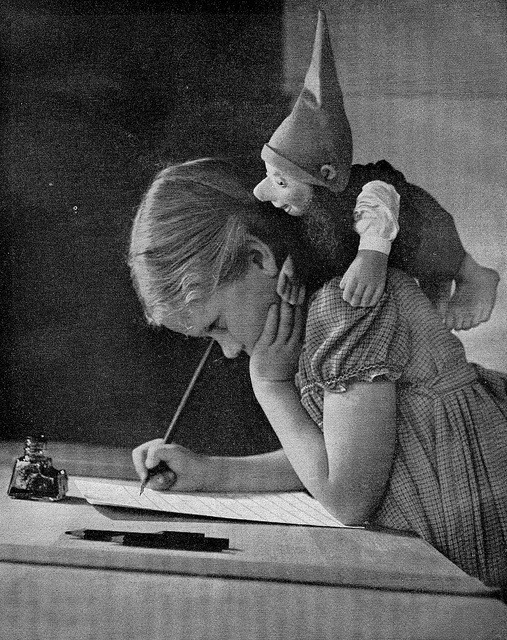 Since we began infiltrating your daily dose of interweb usage in February 2012, we’ve somehow managed to find 400 unique and enthralling things to write about gnomes. Quite an amazing feat if you really stop to think about it for a moment. That was’t a rhetorical statement. I’m literally telling you to stop to think for a moment. Okay fine, you can stop now. Sheesh, are you really that hungover? Yeah, me too. Remember travel gnome Sheldon’s very first post about manatees in Florida? What about the day when prissy princess Tabitha discovered gnome earrings? Or the day our spiritual leader EvanGelical hosted an enlightenment awakening? And who can forget about our travels to see the biggest gnomes in the world? Ahhh…memories. Reminisce with me for a moment. This is when you’re supposed to sigh deeply in response. Do I have to spell out everything for you!? Whatever, I’ll let it slide this once. It’s Saturday after all. We’re simply delighted that our original hometown of Olney, Illinois continues to make headlines with its gnome population! 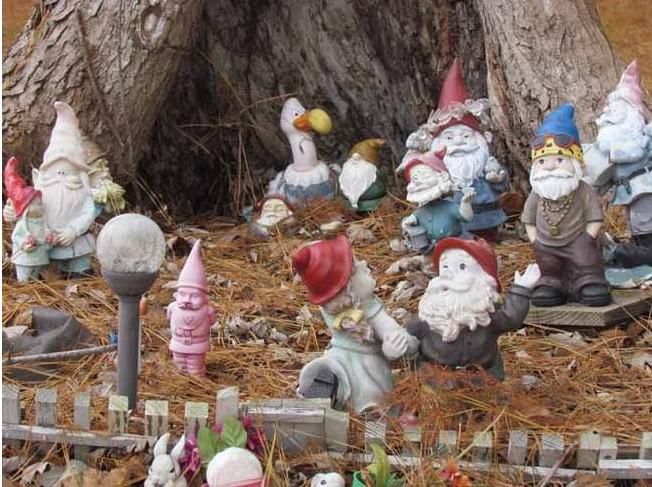 “For more than a year, residents living near Vernor Lake have been building a small community of garden gnomes on the west side of Ill. 130, just south of Richland Country Club. Dr. Don Abel, who lives along the lake, said the project began when he was driving to work. On his way down Ill. 130, he noticed an opening in the base of a tree and thought, “That really needs something in there.” He bought a gnome figurine and placed it in the tree. Before long, another neighbor had made a “Knomesville” sign and the community began to expand. Adding a domestic touch to the scene, Abel bought dolls from the Salvation Army, then used their clothes to hang on a small clothesline. Cathy Fehrenbacher, who lives across the highway from the display, said she and her husband Ed have contributed both pieces and upkeep to the display. Abel said Ed Fehrenbacher serves as the unofficial groundskeeper for the village. “It just kind of kept growing,” Cathy Fehrenbacher said. A small pine tree, which Abel described as looking initially like a “Charlie Brown” tree, was also transplanted in the area and has been decorated with bulbs. It will likely be decorated for Christmas, Fehrenbacher said. From their home’s nearby vantage point, Fehrenbacher said it’s interesting to see people’s reactions when they pass, with some even stopping and having their pictures taken by the village. Neighborhood resident Marilyn Hartrich, who with her husband Rick has contributed to the project, also mentioned the attention the area gets from those passing by. “It’s funny to see all the people stop and look,” she said. Abel said he gets enjoyment from seeing parents walking their children through the display.